The community began our fourth annual varsa—the 3-month “snows retreat” for the monastic community—with ceremonies and Vinaya teachings. Ven. Heng-Ching Shih of National Taiwan University, accompanied by Ven. 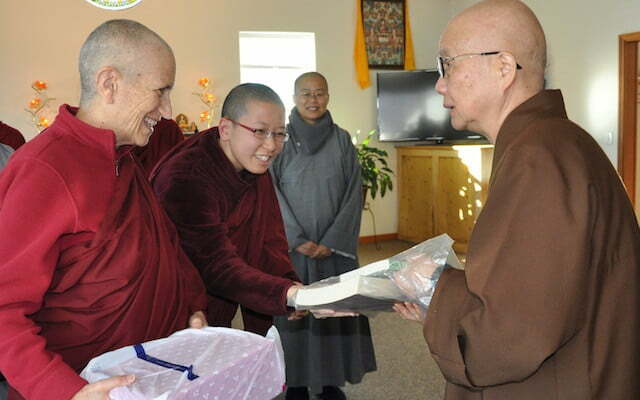 Tien-Chang Shih of Chao-Feng Temple, arrived last week for a nine-day series of teachings on the monastic precepts. What a delight to welcome both nuns back the Abbey! Three years ago, Ven. Heng-Ching came with another nun, Ven. Hong Fan, to teach us the ceremonies for entering and completing varsa. Her translations, as well as her understanding and practice of the monastic precepts and ceremonies, have been a big support for the Abbey. Ven. Tien Chang is also an old friend, having served as monastic guide for our first four ordinations at the Abbey in 2006, 2007, 2008, and 2009. It has been wonderful to share the Abbey’s growth and development with both of them. In addition, we are learning and growing from the Vinaya teachings and discussion. Varsa is one of the three essential rites that the Buddha prescribed for monastics. The other two are the pravarana rite that ends the varsa and posadha, the fortnightly confession and renewal of precepts. When a community of four or more fully ordained monastics practice these, they are considered to be a fully functioning sangha community. This makes a place a “central land,” an essential factor for having a precious human life. The Abbey community began doing posadha in 2011 when we first reached the required number of four fully ordained monastics. We held our first varsa and pravarana in 2014. Very few sangha communities in the West have the conditions to practice these. It is especially rare for nuns practicing in the Tibetan tradition. We are honored and grateful to have this opportunity and much appreciate the generosity of Taiwanese monastics in sharing their wisdom with us. Doing the monastic rites reminds us of our place in a 2600-year-old lineage going back to the Buddha himself. A phrase that is often repeated in the varsa rite is “May this situation come about for all sentient beings.” Here we are reminded of our fortune and responsibility to share the Dharma with all beings. The sangha’s winter varsa retreat overlaps with, but is different from, our annual winter retreat. We will welcome guests to spend a month in meditation on Lama Tsongkhapa Guru Yoga or Four Establishments of Mindfulness at the end of the month.